Katie C. Sopoci Drake, MFA, GL-CMA, is a professional dancer, choreographer and teacher specializing in Laban-based contemporary dance. Her movement musings come from flora, fauna and fiction and as a classically trained vocalist, she never shies away from the use of the human voice in her productions. Currently a core member of Mountain Empire Performance Collective (MEPC) and a company member of Rebollar Dance, past company credits include Mordine and Company Dance Theater of Chicago (2012-2013), Momentum Dance Company of Miami (2009-2012), Wild Space Dance Company of Milwaukee (2005-2009), and Rosy Simas Danse of Minneapolis (2001-2005). Katie has also made appearances with Clancyworks, Core Project, Brazz Dance, Your Mother Dances, The Florentine Opera, The Minnesota Opera and many more. Her critically acclaimed choreography has been performed across the country by many of the companies and colleges she has been with and her works have been performed on stages such as The Colony Theater in Miami, The Southern Theater of Minneapolis, The Milwaukee Art Museum, and the Smithsonian’s National Portrait Gallery in Washington D.C. Katie has been on faculty at the University of Maryland – College Park, The University of Wisconsin – Milwaukee, Nova Southeastern University, Miami Dade College-Wolfson, Miami Dade College-Kendall, Carthage College, and Lawrence University. 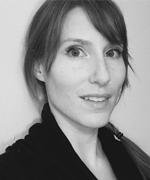 Katie’s own work in Laban Movement Analysis has been presented at the National Dance Education Conference 2015 and the Bill Evans International Conference on Somatics-Based Dance Education 2015; her work with MEPC in long-distance collaboration has been presented at the National Dance Education Conference 2015.